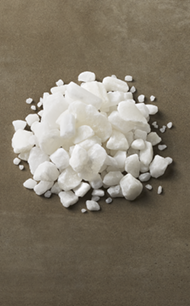 A Low-Sodium Alternative to Traditional Water Softener Salt. Potassium Chloride, Salt Alternative, for Water Softeners is a low-sodium alternative to traditional water softener salts. Made with up to 99.1% pure potassium chloride, these crystals contain low insoluble content to keep your water softener running smoothly. 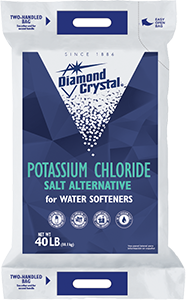 Diamond Crystal® Water Softener Potassium Chloride is recommended for all kinds of water softeners. Potassium Chloride works in water softeners the same way that traditional water softener salt (sodium chloride) does, by replacing hard water minerals. The primary difference is that hard water minerals are replaced with potassium instead of sodium.